A spotting scope is a telescope with a large objective lens, which produces a bright, upright image of great clarity and detail. Spotting scopes typically feature usable magnifications between 20x and 60x in normal daylight conditions. 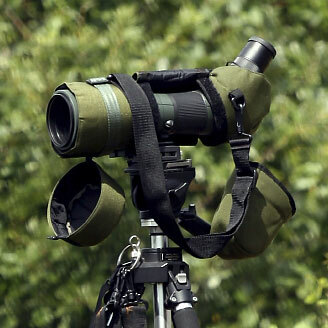 They may have a rubber-armored design and can be mounted to a tripod. 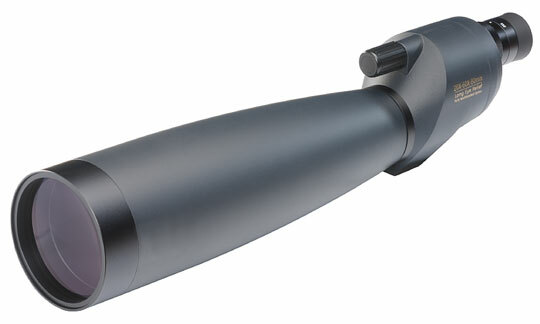 Most spotting scopes are ergonomically designed with a knob for focus control. They include either a single eyepiece with variable zoom or several eyepieces with different magnification powers. Light gathered is determined by the objective lens diameter, which is usually between 50 mm and 80 mm. The two main types of spotting scope are "straight-through" and "angled." On a straight-through scope, the eyepiece and the body of the scope are on the same axis, whereas on an angled scope, the eyepiece is angled about 45 degrees from the scope body. Spotting scopes with a magnification range lying between 20x and 30x are generally favored for bird watching and hunting, while scopes with higher magnification ranges are preferred by astronomers. Some spotting scopes can be used as both visual and photographic instruments. With appropriate adapters, scopes from certain manufacturers can serve as telephoto lenses for 35 mm SLR cameras and digital SLR cameras. The three high-end manufacturers of spotting scopes are Swarovski, Leica and Zeiss. Mid-range Pentax, Nikon, and Kowa brand scopes are more economical, while Bushnell scopes are a popular, lower cost alternative to these brands. Perhaps the most important factor to consider when buying a spotting scope is its lens diameter, or aperture. Spotting scopes with larger apertures can collect more light, resulting in brighter, clearer images. This website, SpottingScopes.us, features convenient access to spotting scope makers who offer a broad selection of scopes and binoculars as well as optical equipment and accessories. To purchase a spotting scope, visit our spotting scope dealers page, where you can browse, shop, and bid on a good selection of new and used scopes. For tips and suggestions about choosing a spotting scope for your needs, including scope selection criteria and tradeoffs, visit this helpful Celestron spotting scopes articles page. If you are an avid bird watcher, you may wish to purchase the Birder's Bible, a comprehensive guide to the exciting field of birding. This book features listings and reviews of birding optics products including binoculars, spotting scopes and accessories.